Looking for a refreshing promotional giveaway? Our custom plastic bottles never fail to satisfy. Affordable and effective, custom printed sports water bottles have the staying power you want in a logo premium. 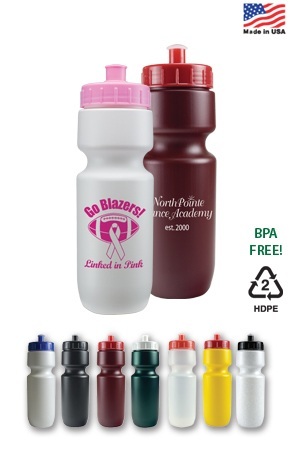 Heritage Advertising offers competitive prices on custom sport bottles like these. And our amazing selection of custom sports water bottles means you’ll find the perfect giveaway for your promotion at the perfect price. 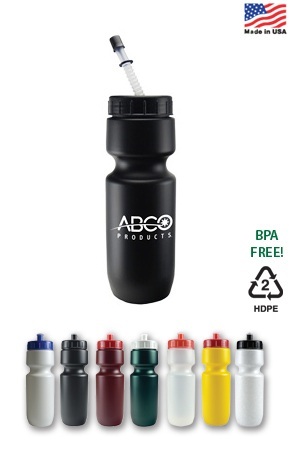 Give these custom plastic water bottles and give the gift of good health. Customized plastic bottles make excellent promotional gifts at that next trade show or marketing event. Imprinted water bottles find their way around, taking your company logo and corporate identity everywhere they go! 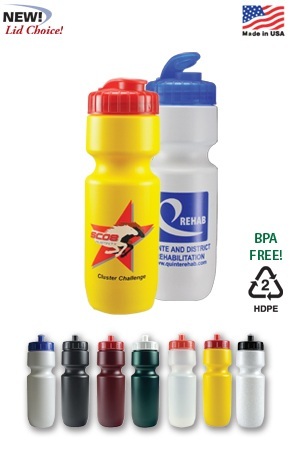 Sports bottles with a printed logo are an efficient and effective marketing tool. Better yet, cheap plastic bottles are easy on your marketing budget. Promotional plastic bottles can be yours for a competitive price when you order from Heritage Advertising. These plastic bottles are the ultimate in refreshment. Our convenient, simple and unbelievably cheap water bottles are exactly the kind of promotional giveaway you’re looking for. Packed with staying power, these cheap sports bottles are always appreciated. Sponsoring a race? Our plastic water bottles are perfect! Get your logo into the game with cheap sport bottles from Heritage Advertising! Plastic water bottles with a custom imprint have been popular with corporate marketing departments for so many years because they work at spreading your corporate image. Each year new designs for imprinted plastic bottles are introduced to the promotional products industry and Heritage Advertising offers many options. If you could use sports bottles with your logo or any other item with your logo, be sure to contact us to find the perfect promotional products to match your advertising need. We offer promotional products such as imprinted plastic bottles and company apparel your company needs to maintain a successful marketing plan. Heritage Advertising can print your company logo onto anything from customized plastic bottles to custom printed t-shirts so be sure to contact us with any marketing idea. Order customized plastic bottles from Heritage Advertising, and you can get cheap plastic bottles without having to compromise quality! If you've been shopping for sports bottles to print your logo on that won't break your budget, look no further. Custom printed promotional plastic bottles are always appreciated and are sure to be used again and again. Contact Heritage Advertising today for a custom quote on promotional plastic bottles or any other promotional product you may need. Approximate Size: Height: 8-1/2" / Diameter at Base: 2-3/8"